Many people think of design and designers in terms of ‘glossy magazines’ probably too expensive and unattainable. A designer’s job is to interpret what you want and not to impose his ideas on you whilst at the same time paying attention to the good and bad points of your site. They can do as little or as much as you want but they can cast a completely fresh eye over the subject that you may have become bogged down in looking at day in and day out! Your garden should be one of the most relaxing and pleasurable parts of your home. That is why utilising a garden designer and the overall garden process is really important and sometimes essential in order to create the space you will always enjoy, that works for you and your family’s needs and one you can feel comfortable in. We offer a personal professional service where our clients can be involved as little or as much as they wish. Our qualified in-house garden designer will make an appointment with you to discuss the project. We will discuss your ideas, requirements and budget. Then the use of the garden, the time of day and length of time you wish to spend in the garden, the time you are able to spend maintaining the garden and other important issues regarding the design and layout. 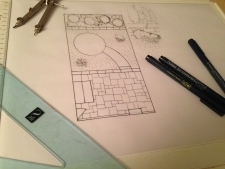 We will then survey the site and prepare hand drawn plans for the development of your garden for your perusal. Once approved the plans will then form the basis for a written quotation for your acceptance then work can commence to create a tailor made garden for you. Our in-house garden designer has a BTEC Diploma in Garden Design (Higher) Level 4, BTEC National Diploma Level 3 with a Distinction Merit Merit grade in Horticulture and a City & Guilds in Horticulture’ in addition to other qualifications.